Many of our lawns look great in the spring. Annual weeds have not had a chance to germinate and our lawns are growing rapidly as a result of the ideal spring temperatures, lack of extremities in both shade and sun, and frequent rainfall. These favorable spring conditions can cover-up what is truly wrong with our lawns. Problems that will only make our lawn deplete during the hot summer months and fall victim to weeds, insects, disease, and drought during the rest of the year. Build a better lawn this year and supplement your lawn food program with products that will help improve the soil conditions your lawn depends on each and every day. Dramatic results can be seen with the addition of two granulated products this spring: Mag-i-Cal (limestone) and Love Your Lawn, Love Your Soil. Mag-i-Cal (Calcium lawn fertilizer / limestone): Ideal soil pH for a western PA lawn is between 6.0 and 7.0. Your lawn can tolerate slight amounts of acid, but too much can cause it to “shut down” and not make full use of the nutrients that you are applying through bagged fertilizers. Over time, acid rain, dog urine, nearby acid-loving plants, and (believe it or not) fertilizer applications will acidify our lawns. With just one application of a fast-acting limestone, such as Jonathan Green’s Mag-i-Cal, you can raise your soil pH in as little as a couple of weeks and start seeing rapid growth, even without the use of a nitrogen based fertilizer! Mag-i-Cal (fast-acting limestone) is 100% organic and safe to use any time of the year, even in conjunction with seeding or a spring fertilizer. It is recommend to apply limestone once a year to keep your lawn in balance. If you haven’t used limestone in years or have trouble with moss and/or dog spots year after year, you might want to consider a second application during the early fall. If you are unsure your soil pH, you can test a location with a simple soil test that costs $1, available in our lawn and garden department. Love Your Lawn, Love Your Soil (Soil conditioner for lawns): Western PA is known for having some of the most compacted, clay soil in the nation. Clay soils do not hold nutrients well and impede the growth of long, tender grass roots. Years of use and neglect only make situations worse and many solutions for improving clay soils can be hard to implement for a homeowner. This is not the case any longer because of Jonathan Green’s revolutionary new product called Love Your Lawn, Love Your Soil. With just two applications in a year, your soil conditions will improve immensely… just sneak a peek at the photo below! This exclusive product will condition your soil up to 2 feet deep, which is much deeper than the 4-6 inches that core aeration will help with. So if your lawn has trouble rooting, rakes up easily, forms puddles quickly, or has trouble surviving the hot summer months, you are likely experiencing the symptoms of clay, compacted soil. 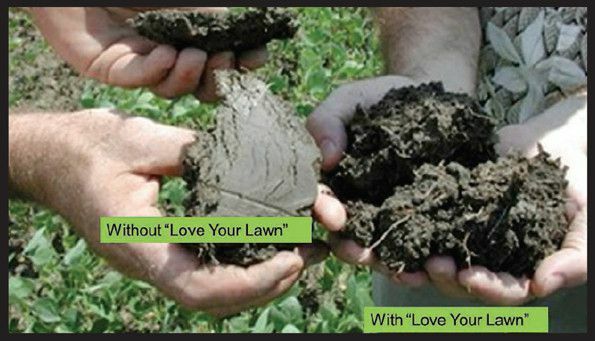 Love Your Lawn, Love Your Soil is the easiest, and best, way to improve your soil conditions quickly! 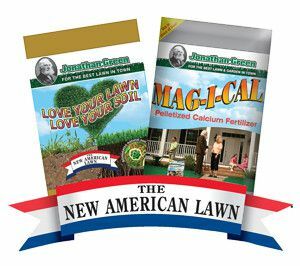 For a greener, more sustainable lawn all year long, supplement your lawn fertilizer program with both Mag-i-Cal and Love Your Lawn, Love Your Soil from Jonathan Green. You will be amazed at the results! Learn more at http://www.newamericanlawn.com. Are you frustrated with your lawn year after year? Do you continually have weeds and bare spots that just don't seem to go away? Have you been applying the same products and never getting the results you want?